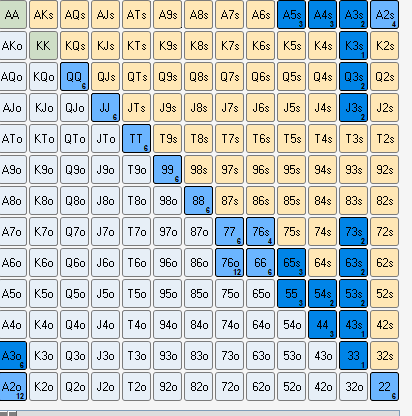 You are here: Home / Forums / Main Poker Forum / Poker Strategy / NL 6-max (stakes: NL20+) / NL50, OP, MPvBB, jam OP vs fish on 4335? Q: Jam KK on this turn? against this calling range we have 47%. If i take out 73s,63s,53s its only 49%. The jam depends on if V has A2o-A3o in his range. With the jam we target OP and A4s,A5s,65s. If villain cold calls 3bets with a wide range liek A3o then we should not jam this turn, i guess. Hoiwever he oinly has pot size left, so I dont think we get out of this pot anyway. And givign him a freecard is not acceptable. So Jam is the best. Q2: What do we do with hands like TT? A2: TT does not have over 50% against V calling range on turn. We could either check turn and bet small on river or bet turn small and check river. Against a big fish like this you should bet way more on the flop, I would bet a little under $10.